When authoring content in Buzz, you are given various activity type options. Each activity type is designed with specific ends in mind and can be used to support various personalized learning models. Review the following activity types to see which best suits your needs, and how to use them. Assessment Assessments are gradable, question-based activities that use questions you create and/or link from question banks. Each question can be aligned with specific objectives in the course, and student performance on objectives can be used to make formative or remediation assessments. Students are required to complete assessments according to conditions set by the course author and submit all answers at once. Assessments are automatically graded and can be password protected. Assignment Assignments are gradable activities that you create using a rich text editor. Students complete assignment activities in their own time and are expected to indicate completion according to conditions set by the course author (e.g., attach a file to a dropbox, enter findings in a text box). Assignments can also be set up to accompany non-digital submissions. Blog Blogs are assigned writing exercises that can be seen by the authoring student, the teacher, and all members of the course (unless it is organized by groups, in which case each student can access only the blogs in their group). Visitors can comment on blogs to encourage discussion and collaboration. Custom Activity Custom Activities allow you to embed SCORM activities, display external web sites, or create gradable activities using styles and scripts that aren't available with Buzz authoring tools. Because it provides greater customization options, these are best suited for advanced users. Discussion Discussions allow you to create a learning activity in which students can respond to a prompt and interact with other students as part of focused conversation threads. All course members can add to and access the thread unless it is organized by groups, in which case each student can access only their group's threads. Embed Code Embed Code to create an activity using HTML; most often, these are HTML snippets provided by other sites. By default, this item is not gradable; you can make it gradable using the activity editor. File Attachment Quickly upload a document for students. By default, this item is not gradable; you can make it gradable using the activity editor. Google Drive Document Use a Google Drive Document as an activity. Your Google Drive must be configured for use. By default, this item is not gradable; you can make it gradable using the activity editor. IMS Package IMS content packages contain simple learning content and metadata created in accordance with international standards. Buzz allows you to import IMS packages (including common cartridges and QTI questions) or SCORM packages into your courses. Journal Journals are assigned writing exercises that only the authoring student, the teacher, and the student's parent or other observer can access. Peer Assessment Peer Assessments allow students to evaluate their peers' performance using a rubric you provide. Practice Questions (formerly Homework) Practice Questions are gradable, question-based activities that use questions you create and/or link question banks. This activity is similar to assessments, but, unlike assessments, students can submit, review, and retake each question at a time. For instant feedback, this activity should only contain automatically graded questions. Project Projects allow you to quickly and easily create robust and organized project activities. You can automatically include a Discussion, Blog, Wiki, and/or Journal, as well as add additional components. Rich-Text Activity This activity type is best suited for delivering information. 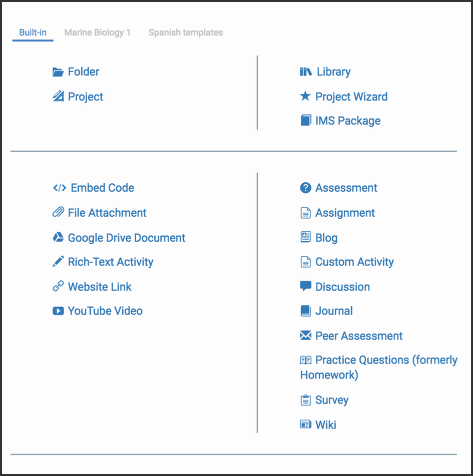 It allows course authors to create activities using a rich text editor. By default, this item is not gradable; you can make it gradable using the activity editor. Survey Link to surveys built using external tools, like SurveyMonkey. Website Link Link to websites for students. By default, this item is not gradable; you can make it gradable using the activity editor. Wiki Wikis allow you to create collaborative writing exercises which can be edited by the teacher and all students in a course. All members can also see a history of revisions and who made them. YouTube Video Embed a YouTube video for sudents. By default, this item is not gradable; you can make it gradable using the activity editor. This is very helpful! Which tool is the best for making things multiple pages so that students page through the lesson rather than having to scroll? Currently there is not a way to break a lesson into separate pages to navigate through in the same item with the editor. It is possible to create a SCORM object or make a lesson with HTML and load it as a file, both of these methods would use the Custom Activity item type. This is for more advanced lesson creation which is beyond the normal area of support for Agilix as the content would be created outside of Agilix tools. I do not see Editable content or File or Website Activity in the picture you have provided. I am unable to find it in my editor as well. Where are these located? I use this for almost most of my course activity uploads. Sorry for the confusion. This table still lists the templates using their previous names. You're looking for "File Attachment", "Website Link", and "Rich-Text Activity" in the new Editor. We will update the table accordingly. Thank you! Thanks Ryan! I am trying to upload some HTML5 course files. I am trying to set them up as lessons. I am not able to find a Activity Template to set them up. They are not loading if I add them as a Custom Activity (which is Gradable and I do not require it to be gradable). Any suggestions? I don't see Essay Question as an option in the dropdown for practice questions. Is this going to be an option? Essay questions and workspaces are not supported in Practice Questions, there is not currently a plan to include these question types for that item type.